My sister and I are 18 years apart and I spent a lot of time babysitting when she was young. There was one incident while I was watching her that I was sure was going to get me kicked out of the house permanently. She was about four at the time and we were building with Legos when she bolted upright and ran through the kitchen and into the bathroom, laughing the entire way. I thought it was strange so I got up to check on her and on the floor I noticed a randomly discarded package of food coloring. All of the tubes were in the box except for the green one. Fearing the worst I banged on the bathroom door, eliciting an eruption of laughter from the other side. I turned the knob and it was locked, so I yelled for her to get into the bathtub. At the sound of her climbing inside I backed up and threw my shoulder into the door, less concerned about explaining the carpentry work that I would have to do than about what the hell she was up to. The door gave way and standing in the bathtub, as proud as I've ever seen her, was my sister showing off her newly dyed green skin. Thankfully she was less Incredible Hulk and more Jackson Pollock with her application, but it didn't negate the fact that it was a week before she started preschool and half her face looked like bad zombie makeup. I couldn't even be mad because I was so panic stricken and she was laughing so hard and I was kind of nauseous as I tried scrubbing her back to her unblemished self. Spoiler alert: food coloring doesn't give a damn about a soap filled wash cloth or the fact that you may get murdered for not stopping your kid sister from giving herself an abstract facial tattoo. 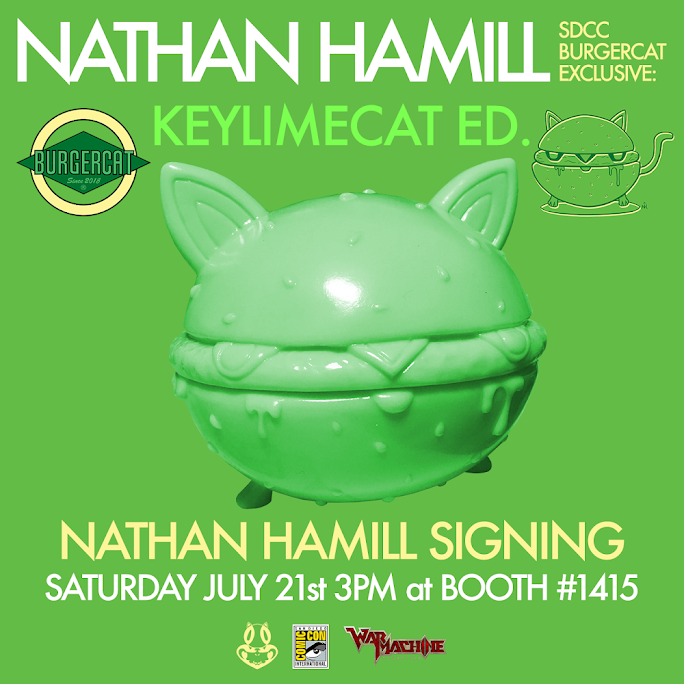 Some things were meant to be green, like string beans, American currency, and this Key Lime BurgerCat from Nathan Hamill and Science Patrol. Is he a cat that looks like a hamburger or a hamburger that looks like a cat? Who cares, because this kitty is made of luxurious Japanese vinyl and is down right adorable. This edition is an exclusive to San Diego Comic Con and can only be had by visiting War Machine Marketing's booth #1415. 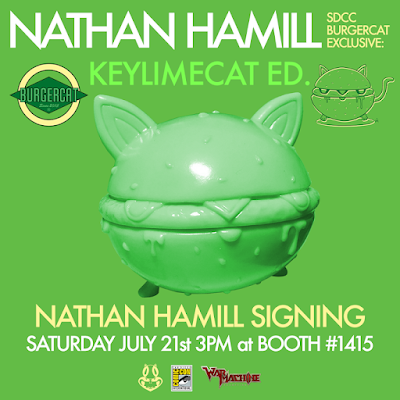 Nathan will be signing them as well on Saturday and all the info you need to meet him and score a BurgerCat are in the photo at the top.